Khushi (Rani Mukerji) is a careless worker always conning her boss and making excuses to bunk her duty. 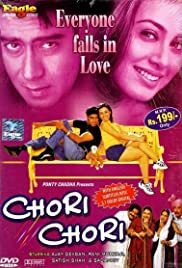 She meets Ranbir Malhotra (Ajay Devgan) and comes to know that the home he plans to build for his love is now a dream unfulfilled. After being dispelled from her job, her devil brain works. She locates the bungalow and moves in, informing everyone that she is Ranbir’s fiancée. There she meets Ranbir’s family and Pooja (Sonali Bendre), Ranbir’s love. When Ranbir returns, at first he is outraged at Khushi’s intrusion in his life, but then decides to play along with Khushi to make Pooja jealous and fall in love with him. During all this fun and conning, Khushi and Ranbir end up really falling in love with each other. However, Khushi’s close encounter with reality and Ranbir’s old commitments hold them back for a long time before they finally listen to their hearts.